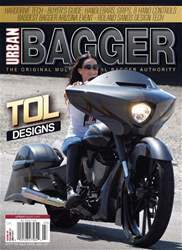 This issue features the TOL Vic (built by TOL Designs) as its cover bike! We've also got AZ-Kicker (built by Xtreme Rides); Demented (built by Timeless Bike Designs); and WIRE TRANSFER (built by Monster Bikeworks, Casey's Chaos, Casey Allen, and Felipe Palacios.) We also include coverage of the 21st Annual Arizona Bike Week, and the 30th Annual Donnie Smith Bike and Car Show! Buyer's Guides are Grips, Hand Controls, and Handlebars. Tech Shop includes articles from Roland Sands Design; HardDrive; RC Components; Paughco & Russ Wernimont Designs; Schaeffer's Specialized Lubricants; and Joker Machine.